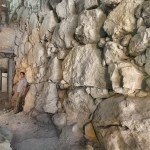 Archaeologists digging in the oldest part of Jerusalem have uncovered a 79-foot-wide wall dating back to the 17th c. BC. That’s back in the Bronze Age, when it was a small, heavily fortified Canaanite town known today as the City of David. 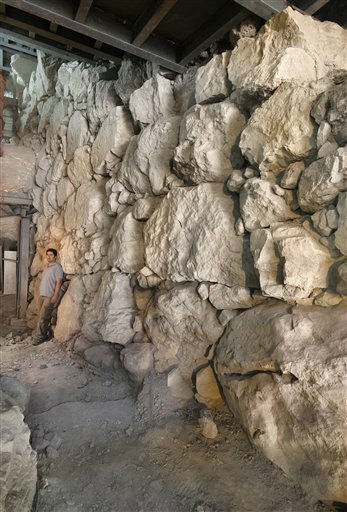 The 26-foot-high wall seems to have been part of a passageway from the City of David to the sole source of water in the area, the Siloam Spring, so it was vitally important that it be secure. No fortifications of this size have ever before been discovered from the time of the First Temple, considered the zenith of Jerusalem’s development in the biblical period. The next period of such massive construction would not be for another 1,700 years, during the time of King Herod in the Roman period. The Canaanite walls the archaeologists discovered are about two meters apart, rise to a height of some eight meters in some places and are made of gigantic stones, three to four meters thick. About 24 meters have been exposed, but excavators say this is only one-third of their original length. A small portion of the wall was first discovered in 1909, but nobody had any idea of how massive it was. Now that this 79-foot section has been found, archaeologists hope that there is a great deal more still to be uncovered. The unexpectedly massive construction suggests a stronger, larger Bronze Age town than people realized. The wall is open to the public starting today. This entry was posted on Thursday, September 3rd, 2009 at 11:50 PM	and is filed under Ancient, Treasures. You can follow any responses to this entry through the RSS 2.0 feed. You can skip to the end and leave a response. Pinging is currently not allowed. Wow, that’s an incredible find for them. It’s amazing how long-held notions can turn on a dime after something like this is discovered and they may not have found everything yet either. “It’s amazing how long-held notions can turn on a dime after something like this is discovered”.. isn’t that absolutely the truth! Before the Dura Europos synagogue was found, all the art text books said that no Jewish paintings were created before the Golden Age of Spain. Then the antique Syrian synagogue, dated by an Aramaic inscription to 244 AD, changed the way we treated Jewish art history. Impressive, it almost makes up for the fact that when we found the legendary city of Jericho, we unfortunately had to announce to the world that it never had any fortifications. So much for the Walls of Jericho.